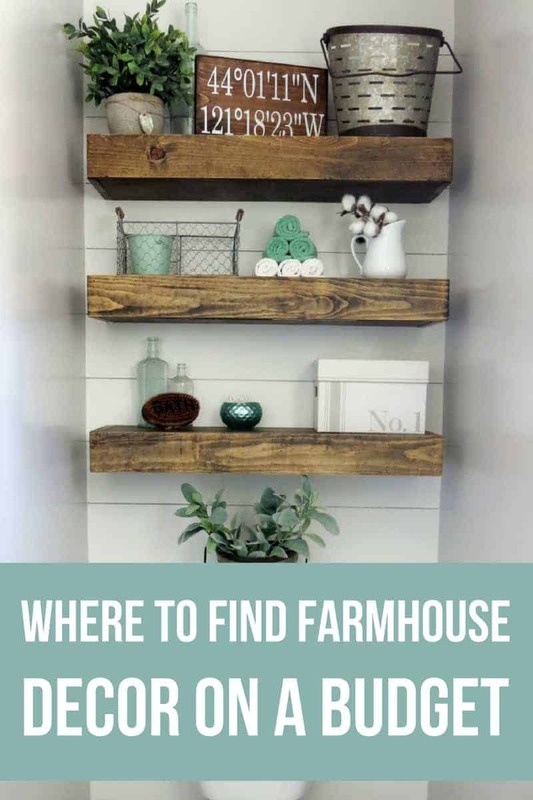 Finding farmhouse decor on a budget is essential if you are anything like me and don’t want to spend a fortune making your house a home you love. And trust me, you don’t have to! That’s why I’m spilling all my secrets about where to find farmhouse decor on a budget. These are the shops I always have my eye on and visit to get inspired! If you are anything like me, you are always looking for ways to save money and find ways to decorate your home on a budget. Maybe you’re even wondering where to find farmhouse decor on a budget. The farmhouse trend has taken over the internet (thanks to our girl Joanna!) and you guys know that it’s one of my favorite ways to decorate! But, just like anything else that gets popular…the prices have gotten INSANELY high for some of the staple farmhouse decor items. I guess we can thank basic laws of supply and demand for that!! As a woman desperate to make our house feel like home, I used to think that I would have to spend a fortune to have a home that I felt proud of. And since I certainly didn’t have a fortune…I didn’t decorate. Chances are you often feel the same way. I held on to hand-me-down furniture and decor that didn’t really fit with my style because I didn’t think I could afford to buy anything new. I watched binge watched Fixer Upper dreaming about someday having the money to decorate my home with that farmhouse style like they do on TV. Here’s the secret that I figured out eventually… you can have a home you love ON ANY BUDGET. I’ve found so many places to find farmhouse decor on a budget, so I’m sharing them all with you! Bring out your inner Joanna Gaines farmhouse style with these DIYs! Etsy is just about my favorite place to shop online for home decor because everything is so unique. You can find something at every budget and for every style and there is NO shortage of cute farmhouse decor. Etsy is the perfect place to order custom pieces for your home. The best part about shopping on Etsy is that you are supporting the makers directly and shopping small. Also, I have my own Etsy shop, Manzanita Exchange, where I love selling handmade home decor and vintage finds. TheMtnBluebirdCo – you’ll recognize the coordinates sign from our farmhouse bathroom! Amazon is obviously the most versatile place to shop for budget-friendly home decor (and really everything else you’d ever need). They have great farmhouse decor on a budget too! The best kept secret about Amazon is their “handmade” section. Much like Etsy, you can order handmade home decor from the makers themselves. Just change the category to “handmade” when searching in Amazon to take a look at the awesome shops. Did you know that Amazon Prime members get FREE 2-day shipping? Take advantage of a free 30-day trial. The #1 best place to find farmhouse decor on a budget is Craigslist and Facebook Buy/Sell groups. You’ll be amazed at the discount you are able to receive by buying furniture and decor from people that are moving or just decluttering. Yard sales, thrift stores and estates sales are also amazing places to find unique and inexpensive home decor with farmhouse style. Another hidden gem is salvage stores (like Habitat for Humanity’s ReStore). We’ve able to get furniture and lots of materials to be reused for in our fixer upper at our local ReStore. Be sure to keep an eye on the free section of Craigslist and join any local Free stuff Facebook groups! I got some old chairs for free and upcycled them into this fun outdoor bench! Decor Steals has great farmhouse home decor on a budget. Here’s the catch…they only have one “steal” (or item) per day and then usually a couple of other items that are “extended steals” that are still available. Antique Farmhouse offers farmhouse style and vintage inspired home decor up to 80% off retail. There are daily deals emails that go out and they have more available online as well. Target is a great place for high-quality home decor on a budget. They have regular sales too! Hearth & Hand (Chip & Jo’s line) and the Threshold collection are my two favorites. I also love the Nate Berkus and Project 62 lines for a more modern look. Don’t just think of Target for the trendy accents either, they have great area rugs and furniture too! Did you know that can save extra 5% every time you shop at Target by using a REDCard? 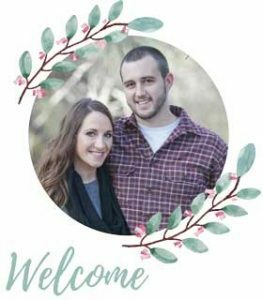 Hobby Lobby is a one stop shop for DIY craft supplies and discount farmhouse home decor. I love Hobby Lobby for oh so many reasons, but I love the wall decor and decorative storage the most. The sales are pretty amazing. A little birdy told me that about half the store is on sale for 50% off all of the time. If if you don’t have a coupon and the item you want isn’t on sale, check back in a week or two and chances are that it probably will be! You’ll always have a coupon in your back pocket by downloading their app or getting on their email list. Since I’m a big time crafter and DIYer, I end up finding a lot of farmhouse decor on a budget at craft supply stores (because I’m there A LOT)! I love Michaels! They have a great faux floral and greenery section (perfect for that farmhouse style! ), seasonal decor, decorative storage and on trend decor accents….not to mention all of the fun craft supplies! JoAnn also has great farmhouse decor finds mixed in with the craft supplies. The seasonal decor there is my favorite (usually up near the entrance of the store so you can’t miss it!). Many times it is rather neutral and can be reused all year round. Both JoAnn and Michaels have an app and email lists with coupons. Every few weeks or so, they will come out with a 15-25% off everything coupon. I try to wait to purchase anything until I have one of those! I’ve even seen JoAnn’s release a 40% off everything coupon! You better believe I went to the store right away when I got that one, haha! 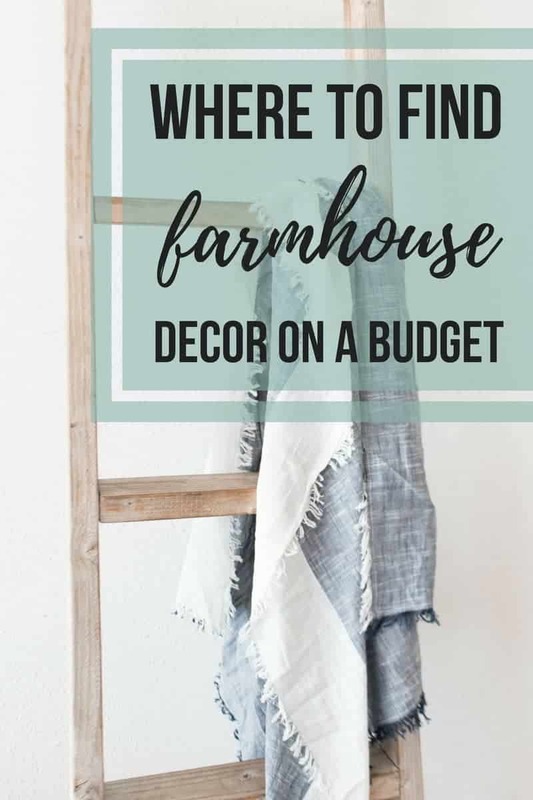 If you’re struggling to decorate your home because you feel like everything is too expensive, hopefully this post opens your eyes to all of the great places to find farmhouse decor on a budget. Making your house a home you love doesn’t have to cost a fortune! With a little digging around in clearance piles and yard sales, you can find great farmhouse decor on a budget! 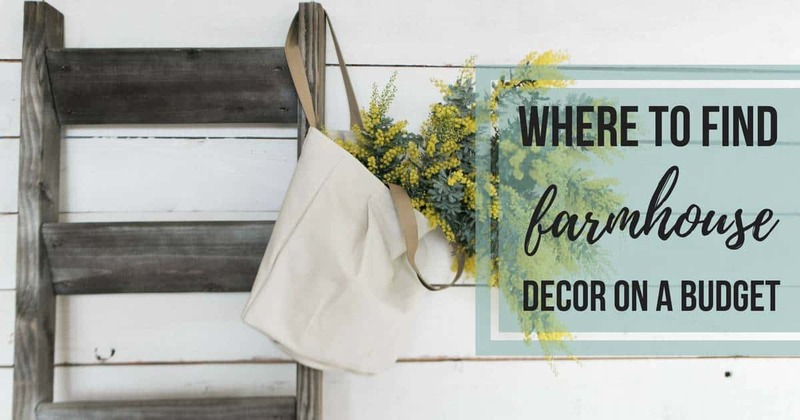 Where is your favorite place to find farmhouse decor on a budget?